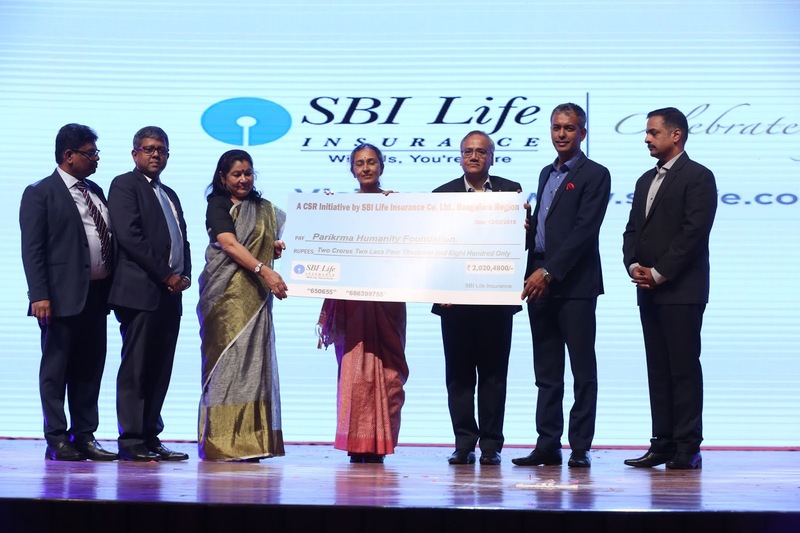 SBI Life Insurance, one of the most trusted life insurance companies in the country, partnered with Parikrama Humanity Foundation taking on the happy responsibility of the complete development of 550 lesser privileged children. The end-to end model will see SBI Life supporting the children right from Kindergarten through university (by providing higher education and scholarships) and will also further support them to be meaningfully employed. 330 children from Classes KG through X and 220 students enrolled in Classes XI and XII (Junior College) at the Parikrama learning centre in Sahakaranagar, Bangalore will be supported by SBI Life. Mr. Sanjeev Nautiyal, MD & CEO, SBI Life Insurance handed over the cheque to Ms. Shukla Bose, Founder, Parikrama Humanity Foundation in the presence of Mr. M Anand, President- Zone II, SBI Life Insurance, Mr. Debasis Chatterjee, Regional Director-Bangalore, SBI Life Insurance and other dignitaries from SBI Life Insurance. SBI Life has emerged as a leading life insurer in Karnataka registering Rs. 561 crores of new business premium collection from the state for the nine months ended 31st December 2018, as compared to Rs. 495 crores in the same period last year, growing a healthy 13.5% over last year. Parikrma Humanity Foundation, is a non-profit organization that aims to ensure that the poorest of children can access the best possible opportunities in the world. Over the years, Parikrma has helped transform the lives of 1700 children, from 69 slum communities and 4 orphanages across the city. Parikrma students have successfully integrated with mainstream institutions across different segments of society, and are contributing towards positive change in the country.